A Champ certificate is earned when you reach level 5 and graduate your Champ, which means there is only one certificate per Champ. If you are set to receive emails, we will email your certificate to you, but all teacher users can also access the certificates from inside your account. Click the menu icon at the top left of your screen to open the sidebar menu. 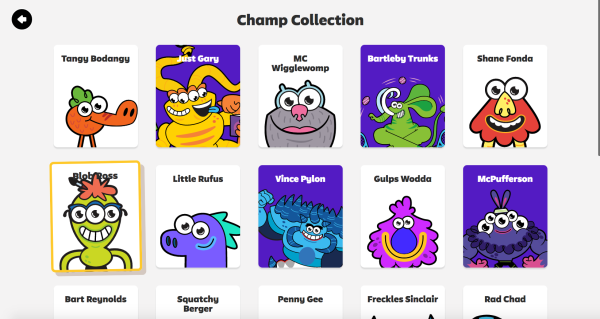 Click the Our Champ Collection link that is just below the picture of your class' current Champ. Graduated Champs will be shown on a purple background, and your current champ will be shown with a yellow border. Click on the Champ who's certificate you want to reprint. Click Print Award to print the certificate. It will open as a PDF in a separate browser tab. Note: The Champ Collection page is class specific - you will only see the completed champs in the class you are currently using. If you've maxed out champs in multiple classes, you will need to switch classes to see each class's completed champs.